We've seen a few apps and services offer virtual phone numbers before - numbers that aren't tied to a specific SIM card and can be used with an account connection rather than dedicated hardware. It's especially handy for bring-your-own-device situations at work. But T-Mobile seems to be the first major American carrier to embrace the idea with its new DIGITS system. The service allows customers to use any number of, um, numbers tied to their wireless accounts, including disposable numbers that can be added and abandoned with ease. T-Mobile's product examples for DIGITS are familiar, instructing customers to treat phone numbers more like email addresses. Multiple numbers can be accessed from one device, and all of said numbers can be accessed from alternate devices, all connected via the same T-Mobile account. 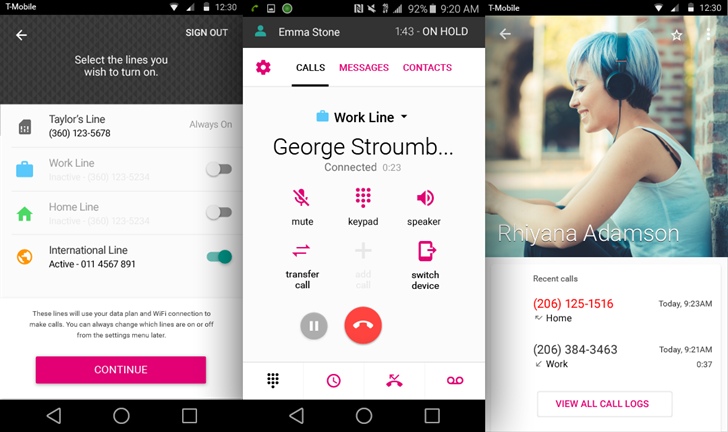 Calls and texts are handled on T-Mobile's standard network. Using the DIGITS dialer app, customers can even access their numbers for calls and texts on another Android phone on a non-T-Mobile carrier. At the moment DIGITs is in beta, so it's free - there's no indication of when the beta period will end. Technically the beta is closed, but T-Mobile's FAQ makes it sound like most customers are getting in. There are a couple of limitations. One, users need to be on post-paid consumer accounts, so prepaid and business accounts are out. Second, you'll need to be the primary account holder in order to add new numbers. Third, existing T-Mobile numbers (the ones associated with physical SIM cards) can't be converted into DIGITS numbers. That's the real bummer out of the initial announcement; if you want that cool cross-device functionality, you'll have to start giving out a new number to your friends, coworkers, and/or potential romantic partners. T-Mobile isn't saying how long the beta program for DIGITS will last, or how much the service will cost after it's completed.